Gillard and Abbott talk about restraining immigration and sound dinky di, but each is more representative of the changing nature of our population they would have us believe. Whichever candidate takes office after the poll will be the first foreign-born Australian elected Prime Minister since at least John Gorton, and there's doubt about whether he was born in Melbourne or in Wellington, New Zealand. 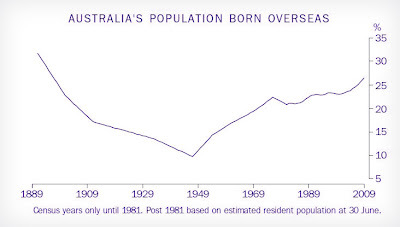 But when Gorton became Prime Minister in the late 1960s only 1 in 5 Australians were born overseas. New figures released yesterday show steady increases in migration since have pushed up the total to an astonishing 1 in 4. By mid last year an extraordinary 26.5 per cent of the Australian population had been born overseas - the highest proportion since Federation. The Bureau of Statistics figures show Australia at its most Australian in modern times in 1947 when 90 per cent of Australians were born here - with the actual proportion doubtless higher given that at the time Aboriginals were not automatically included in the census. Abbott and Gillard are also representative of the record 5.8 million Australians born overseas in another way... Each was born in the United Kingdom which remains the biggest single foreign birthplace for Australians, supplying 5.4 per cent of our present population, followed by New Zealand with 2.4 per cent. Over the past decade China and India have displaced Italy and Vietnam as our third and forth most important foreign birthplaces, supplying 1.6 and 1.4 per cent of our population. And the most recent crop of migrants are about the most useful we could want. According to the Bureau of Statistics an impressive two thirds of recent migrants are aged between 15 and 34, compared to less than one third per cent of the population at large. This means migrants are most unlikely to need support in either nursing homes because they are old or in schools because they are young, and are highly likely to be in a position to provide support to an increasingly aged Australia. These are the sorts of questions Tony Abbott has pledged to ask a renamed Productivity and Sustainability Commission if he wins office. The figures show migrants overwhelmingly chosing to settle in NSW and Victoria with Queensland a distant third. But as a proportion of its population Western Australia is by far the state most affected with migration accounting for 4.4 per cent of its population turnover, compared to 3.5 per cent in eastern Australia. Around 30 per cent of Western Australian were born overseas compared to 26 per cent in NSW and Victoria. Julia Gillard will go the polls with the ultimate economic double -- both falling inflation and falling unemployment after a surprise dive in inflation removed the prospect of higher mortgage rates in the lead-up to the election. The Reserve Bank board meeting will vote to leave interest rates on hold Tuesday after the closely-watched underlying rate of inflation slid to 2.7 per cent, the first time it has been below 3 per cent and within the Bank's target band for three years. "I am encouraged, but not complacent," Treasurer Wayne Swan told the Herald. "Inflation is back in the band as we forecast, but we are heading into Mining Boom Mark 2. There will be pressures on infrastructure and housing which will need long-term solutions." Opposition treasury spokesman Joe Hockey declared the figures a sign of failure. "I'm sure the Treasurer will say that inflation is under control," he told a press conference. "But you can't say that to Australian families that are paying 18 per cent more for their electricity, who are paying 14 per cent more for their water, 10 per cent more for their gas and nearly 7 per cent more for hospital and medical services." While utility prices climbed enormously in the year to June almost every other price rise was low to sharply negative... Bread, an early feature of the Coalition's campaign climbed in price just 2 per cent in the year to June. In the most recent quarter it fell in price or was steady in every city but Melbourne. The price of clothes slid a further 4 per cent, the price of cheese and eggs 1 and 4 per cent and the price of computers and audio visual equipment a further 20 per cent. "We are seeing extensive discounting," said Commonwealth Bank economist Michael Blythe. "It's in household appliances, insurance, holiday travel and accommodation and clothing; and its something of a ticking time-bomb. A return to more normal conditions could see the discounting quickly reversed and inflation climb." The headline inflation rate of 0.6 per cent would have been only 0.3 per cent had it not been for the one-off 25 per cent hike in tobacco tax. "There will be no interest rate hike next week," said Macquarie Group economist Rory Robertson. "If you were thinking the Reserve Bank might make the election campaign interesting, think again." The governmetn faces only one more economic hurdle ahead of the August 21 election, the release of the July uenmployment figures Thursday week, just nine days before the poll. 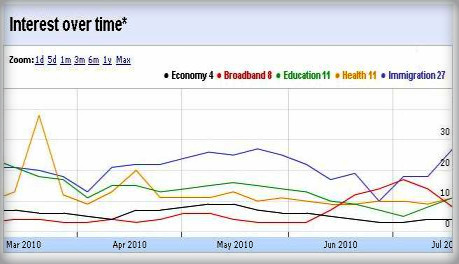 The unmeployment rate has been below 5.5 per cnet all year and is currently 5.1, very close to the 5 per cnet mark defined by the Treasury as "full employment". Australia created 45,900 jobs in June, the eleventh successive month in which employment has climbed, typically at the rate of around 1000 jobs per day. Almost all of the new jobs created in June were in the mining-dominated states of Western Australiaand Queensland. those states have the fastest inflation in Austalia, with prices growing at annualr ates of 3.5 and 3.2 per cent. Prices in Sydney climbed 2.9 per cent and in Melbourne 3.1 per cent. A lot less than we care about a number of other things, most especially immigration. Check out Google Election Trends. Bless them. There's less money in the cupboard. Now go for it. Australia's budget is shrinking, even as our politicians come up with new ways to spend it. 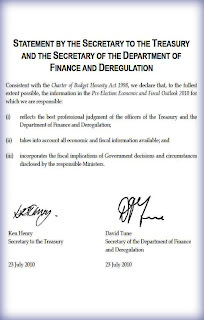 The official Pre-election Economic & Fiscal Outlook - released yesterday in accordance with the Charter of Budget Honesty - shows government finances down half a billion on the economic update released just 12 days earlier. Only $40 million of the $568 shortfall is due to extra spending decisions. All of the rest is due to updated information about revenue and expenditure, both moving in the wrong direction. Although the changes are small in the context of the four-year projection period, in an election where promises are being costed in tens of millions rather than the more traditional hundreds, they they will significantly limit the room each side has to move. Lifting spending in the forward estimates period are some road programs not completed in 2009-10 and a revised estimate of the expense of the childcare rebate. The economic forecasts underlying the projections are unchanged. In all but one of the next four years the budget outcomes are worse, although in 2012-13 the projected budget surplus is slightly higher - $3.5 billion instead of $3.1 billion. Coalition finance spokesman Andrew Robb dismissed the improvement saying in his view the Gillard government would never deliver a surplus. "The assumptions are questionable and very optimistic," he said. "We can't see a leopard changing its spots." He pledged to use the $394 million Labor had allocated to its "cash for clunkers" program, to help pay-off government debt. Mr Swan said the figures were prepared independently of the government in accordance with the Charter of Budget Honesty and that he hadn't seen the document ahead of its release. Separate Australian Bureau of Statistics figures on producer prices make it a line ball call as to whether tomorrow's consumer price index will be high enough to trigger a Reserve Bank interest rate rise. The mid point of estimates is now for an annual underlying inflation rate of 3 per cent, about the level the Reserve Bank regards as its "line in the sand" beyond which it will push up rates when it meets a week from today. Pricing figures released by Coles suggest the quarterly inflation will be low. It reports deflation in its prices over the past six months, driven by lower fresh food prices and cuts in the price of its home brand products. It says its food and liquor prices slid 1.4 per cent in the June quarter despite the increase in tobacco tax. Population growth is the only bright spot in an in an otherwise bleak assessment of the NSW economy which rates it number 7 out of Australia's 8 states and territories - a distinction it shares with Queensland. This morning's Commonwealth Securities "State of the States" report ranks NSW the worst or second-worst state when it comes to economic growth, retail spending, employment, construction activity and dwelling starts. "Population growth is really the state's only economic driver," said CommSec chief economist Craig James. "Immigrants come mainly to the key centres of Sydney and Melbourne and they tend to stay." In NSW population is growing at 1.64 per cent, well above the decade-long average of 1.1 per cent and about double the pace of recent years. "We do have a problem providing services and land for the extra population, but without it we would have little going for us," said Mr James. "Even the Australian Capital Territory has economic driver in the dwelling sector... but in NSW we haven't had much of a mining sector, we haven't had the dwelling sector, our finance sector has been going backwards and even tourism hadn't provided an impetus." "Immigration is about the only thing driving the state's retail spending, its dwelling investment and business investment. If immigration was cut, NSW would have the most to lose." The survey ranks economies on their current performance compared to long-run averages. The methodology works against states such as NSW and Queensland which led Australia in earlier decades. The number one state in the survey, Western Australia, is exceeding its decade-long economic growth rate by almost 30 per cent. NSW is performing the weakest in relative terms, exceeding its decade-long average by less than 15 per cent. A separate survey by economic consultant BIS Shrapnel also released today predicts a return to growth in the NSW residential construction "coming off a very low base". The study nominates slower population growth and the withdrawal of government stimulus payments as "the two major drags on economic growth" in the coming year. BIS Shrapnel is forecasting a sharp cut in net migration to 175,000 in 2011, the lowest rate in five years following earlier changes to migration rules. In 2012 it expects net migration to slide to 145,000.
. Prime Minister Gillard says the city of Sydney is exploding. In fact it's growing more slowly than most. Did we get the debate we deserved? Both leaders say they are concerned about the price of bread, but neither has much idea about how to restrain it. Abbott said he wouldn't promise a Grocery Choice website and he wouldn't run up government debt. Gillard said she wouldn't impose a new parental leave tax. Perhaps they should go shopping. Researchers from the Bureau of Statistics priced a sliced white loaf at an average of $3.88 during the first three months of this year. A year earlier they had recorded the same average price - $3.88. The Bureau's overall measure of all food prices has limped along at a mere 0.7 per cent over the past year. Energy prices are soaring, in part because investments are stalled until our leaders can make up their minds about emissions trading. But food seems to be behaving okay, without their help. Neither Gillard nor Abbott know what they'll do if the global recession returns. Or if they do, they won't say. Both are committed to returning the budget to surplus in three year's time. Asked whether they would amend the timetable if conditions turned nasty, neither would countenance the possibility. Gillard simply reiterated the commitment, and talked about Kevin Rudd had done the right thing last time. Surprisingly, Abbott agreed. The Coalition had supported the measures that pushed the budget into deficit, but not all of them. But when it comes to the present, lingering deficits are bad. What neither would do was acknowledge the question asked. The world economic outlook is uncertain. Last week seven European banks failed so-called stress tests. Seven US banks were taken over by regulators. Are they prepared to reassess their determination to return the budget to surplus if those developments drag down the global economy? Presumably the answer is "yes," but without departing from their scripts, neither would say. Abbott talked about debt, Gillard talked about Kevin Rudd's wisdom in deploying it well. Both wished economic problems away. Good evening and welcome to the National Press Club in Canberra for the 2010 Election Leaders Debate. Please make welcome Prime Minister Julia Gillard and Opposition Leader Tony Abbott. My name is David Speers, I’m the political editor of Sky News Australia, and tonight we have three of the country’s best journalists on our panel to pose questions to the leaders. Please welcome Chris Uhlmann from the ABC, Laura Tingle from the Australian Financial Review and Malcolm Farr from the Daily Telegraph. Well, all of us have to vote on August 21 and tonight we want to help you decide who should be leading Australia. Both parties have agreed on a set of rules governing tonight’s debate, but we want this to be a real debate as well, where we can hear what both of you stand for and the direction you’d like to take Australia in. Now, the Opposition Leader won the coin toss and decided to send Julia Gillard in to bat first. So, Prime Minister, your opening statement. Thank you very much David, thank you Tony. In 27 days time Australia will make a choice. I believe it’s a choice between Australia moving forward or going back, and I know you’ve heard me say those words before. So tonight I’m just going to take a few minutes of your time to explain what I mean by those words. I think Australia is a great country. The best country on earth. But it can be a better country. And that’s what I mean by moving forward. All of that starts with a strong economy, with a prosperous Australia. And that’s why, when the global financial crisis threatened this country, we did what we needed to do to protect Australian jobs. Now, that was the better economic plan. And for the future we have the better economic plan. A plan to bring the budget back to surplus in 2013, three years earlier than scheduled and before any other major advanced economy in the world. An economic plan where we’ve given the mining industry certainty, and we will cut company tax, because that will make a big difference for jobs in the future. A better economic plan where we can increase superannuation for more than eight million hardworking Australians. A plan to support small business. And a plan to build the National Broadband Network, because that is so important to the jobs of the future, and how we will live in the future. And with a strong economy, then we can provide the services that families need. Great schools, decent health care. I’m absolutely passionate about making sure that every Australian child, every child, gets a first class education. That’s why I will deliver a national curriculum. Why I will keep investing in the quality of the teachers standing in front of that classroom. Why I will keep rolling out our Trades Training Centres, because they’re so important, just so important to getting the real skills that kids need for life and for work. And it’s also why I want to invest in a GP after hours hotline, so you can find a doctor when you need one. That’s why I’ll train 1,300 new GPs and 3,000 new nurses. Great services, good schools, that I believe takes us forward. I also believe it takes us forward if we have a sustainable Australia, not a big Australia. And that’s why, that’s why I want to make record investments in solar and renewable technologies. I believe in strong border protection, and cracking down on people smugglers. I also believe this is not a time for us to turn back. If you want to lead this nation, you’ve got to have your eyes on the road ahead, not in the rear-vision mirror. That’s what I stand for. Prime Minister, thank you. Mr Abbott, your opening statement. Thanks David, and thanks Julia. This election is about a fair got for families struggling with cost of living pressures. It’s about a government that you can rely on to deliver. It’s about respect for democratic process. My wife, Margie, and I know what it’s like to raise a family, to wrestle with a big mortgage, with grocery bills and school fees. But I can deliver for Australian families, because I have been a senior Minister in an effective government. In government I started the Green Corps for young Australians working with the environment. I massively expanded Work for the Dole, and as Health Minister I got bulk billing to record levels, put an extra $10 billion in public hospitals, and expanded Medicare to cover allied health professional treatment, including dentistry. I tell people what I believe, and I can deliver. If you elect the Coalition, you’ll end the waste, you’ll repay the debt, you’ll stop the taxes, and you’ll stop the boats. That is my pledge, that is my action contract with the Australian people. But Julia Gillard can’t talk about her record because things have gone from bad to worse since she took over. There’s the boat people fix that got lost, somewhere in the Timor Sea. And there’s the climate fix which is just another talkfest. It’s not good enough, and it will just get worse, while a bad Government thinks it can spin its way our of trouble. There is a better way. If you elect the Coalition, you’ll get a fair dinkum paid parental leave scheme. You’ll get a standing green army, 15,000 strong, to work on land care projects. You’ll get community run hospitals, with more beds. And you’ll get schools run by parents, not bureaucrats. So I ask for your support to end the waste, to pay back the debt, to stop the tax, and to stop the boats, because that’s what the people of Australia have a right to expect from government. Tony Abbott, thank you. Before we get to questions from our panel, I just want to kick off with a couple of the broad themes you both raised there. Prime Minister, first to you. When you did bring down Kevin Rudd a month ago, you acknowledged it was because the Government had lost its way. And you said there were three areas that needed to be fixed, asylum seekers, the mining tax and climate change. But on asylum seekers, boats are still arriving, there’s still no real solution there. On the mining tax, big sections of the mining industry are still deeply concerned about the tax, and on climate change you’ve proposed another talk fest. So have we really moved forward? I believe David, we have moved forward and let me go through some of those issues. What I wanted to do was bring certainty to the mining industry and now we have an arrangement where the biggest miners in this country have agreed to pay more tax. Now, Tony said he doesn’t want to take it but that extra tax, that $10.5 billion will support vital things like cutting company tax, growing the jobs of the future, investing in superannuation, investing in infrastructure, and supporting small business. Yes, there’s a process to work through, led by a leading Australian miner, Don Argus. And of course on asylum seekers and border protection: I want to strengthen border protection. I want to make sure that we don’t stop boats when they’re in our waters. I want to make sure they don’t leave foreign shores to get here. Now, that’s going to take some time and working through with our regional partners, and we’ve started that process. And at the same time I’ve invested in increased surveillance and other equipment to work with Indonesia, one of our regional partners. Now, on climate change, once again, I believe in climate change, I believe it’s real. And I think Australians can help me here, help me, help the nation, help their fellow Australians work through to a community consensus about a long-lasting solution. But in the mean time, in the mean time, we’ll make sure that there are no new dirty power stations built. We’ll make sure we invest $1 billion in bringing the clean energy of the future from remote parts of the country, the north of Queensland, Western Australia, the Cooper Basin in South Australia, to our very own homes. We’ll invest to make sure that we’ve got a more modern car fleet, greener buildings and we’ll be rewarding companies that are early movers to getting things right. These are big steps forward and part of my plan for a prosperous Australia and for a sustainable Australia, not a big Australia. Tony Abbott, the Liberals have churned through three leaders in three years. You were installed as Leader by just one vote in the Party Room at the end of last year. You yourself have changed your position on things like Work Choices, and on climate change, on the emissions trading scheme, and you describe yourself as a bit of a weather vane on this as well at one point and you’ve also acknowledged that you don’t always tell the gospel truth. So how can we be sure what you will do in government? Because, David, I am giving people very, very clear commitments. Unlike the Government, you won’t get a lot of waffle. You won’t get a whole lot of proposals that aren’t fair dinkum. I mean, on the boats, the former Coalition Government stopped the boats. The current Government started the boats. It will take the Coalition to stop the boats again. And if Julia was fair dinkum about stopping the boats, she wouldn’t be pursuing this fanciful deal with East Timor. She’d pick up the phone to the President of Nauru because he wants to reopen the Australian-built detention centre there and he says that he can do it in a matter of weeks, not years. On the mining tax, well, my position is absolutely crystal clear. It’s a bad tax. It will make our most successful industry uncompetitive. It will give us the highest mining tax rates in the world. Julia says, Julia Gillard says that the big miners accept it. They don’t accept it. They just think it’s the best deal they can get from a bad Government. And certainly, the small miners, who were locked out of this deal, they dislike it so much, they’re about to start their ad campaign again. Now, on climate change, look, there are a lot different views that people have on climate change and how best to deal with it. But we have a clear and definite policy. Not a talkfest, but a clear and definite policy which can deliver the five per cent greenhouse gas reduction target by 2020. Let’s get into some specifics from our panel of journalists. The first question comes from Chris Uhlmann. A question to you both, but Ms Gillard first though. Do you think that occasionally the courage to stand against the mob is a sign of a true leader? And if so, can you both give us one example of how you’ve demonstrated that in this campaign? I think it’s very important that when you lead, that you do show the courage of your convictions and you lead. And I think, Chris, I’m entitled to point to my track record and say that I’ve delivered some reforms that we pretty hard, pretty disputed at the time. My School would probably be the biggest example that the public would be aware of. It wasn’t easy, staring down a strike by teachers to make sure we delivered the kind of transparency that parents want. And I thought it was the right thing to do, and I got it done. Perhaps less transparent to the Australian people: getting new occupational health and safety laws. Laws around the country. Businesses been complaining for 30 years that they have different obligations in different states. And at the same time, not every individual worker had the same safety standards. Now, I’ve delivered that. 30 years on the day we delivered it, there was some public servants that actually had tears in their eyes because they’d spent all of their working life, waiting for someone to deliver that reform. Wasn’t easy, but I got it done. And what I think that shows is that if you believe in something passionately, then you will work through. But Chris, I don’t make any apology for setting up processes that enable me to bring the Australian people with me. If we’re going to have deep and lasting reforms, like reforms about climate change, can’t be hostage to swings and roundabouts, to a new Opposition Leader, to a shattering of political consensus in Parliament House not far from where we are now. If we’re going to have deep and lasting change, then I do want Australians to come with me, and that’s what you’ve seen, when I’ve announced our climate change policy, to give just one example. So leadership, it’s about courage, it’s about conviction, and it’s about persuasion to get people to come with you. Prime Minister, can I just pull you up though, on the main example you cited there of your courage on MySchool. You did have overwhelming popular support for that. It was the unions that were the only ones opposed. Well, it still required, let me tell you, standing up in some not so easy times, to get it done. And I would say this, delivering MySchool was actually so easy, given that people have talked about transparency in this country, wanting to know what was happening at their local school for decades, Why hadn’t it been done before? I got it done, got it done by showing the courage of my convictions and pushing through. And it’s an important reform because, for the first time ever in this country, school by school, we can see how those schools are going and we can check whether the kids in them are getting a great quality education, it was worth fighting for. Mr Abbott, your response to that? Well, thanks David and thanks Chris. And if I may, the Prime Minister doesn’t have a lot to talk about after three years in government. I think that anyone who watched my record in government would say that there were a whole host of issues that I drove, not all of them popular. And just to take one issue that I intend to drive now and in the future, let’s take paid parental leave. This is not just a visionary social reform but it is an important economic reform too. It will not only give women the real choice that they need and have been denied for too long. It will give families struggling to pay the mortgage the money that they need at a time when they are most vulnerable and in the long run, it will be of great help to Australian businesses. The Intergenerational Report of my friend and former colleague, Peter Costello, said that if we are to meet the demographic challenge we need to address the three Ps. Population: paid parental leave helps. Productivity: again paid parental leave helps, very much, because it keeps experienced workers connected to the workforce. And participation: what could be better constructed to ensure that we keep 50 per cent of our talented workforce engaged in work? So I think paid parental leave is something that I have pursued, just in the last few months, it hasn’t always been popular. It’s still not entirely accepted out there in the community. The Labor Party certainly doesn’t accept it. They’ll fight it because they think their rebadged Baby Bonus is enough. But I am very happy to stake my political future on this visionary social change and important economic reform. Alright, our next question comes from Laura Tingle. I’ve got a question for you Mr Abbott and it goes to the point you’ve just been making about the Inter-Generational Report. The Coalition in Government actually pursed big population policies, partly driven by that report, everything from the Baby Bonus, through to luring overseas students here with a promise of permanent residency. It was this policy that produced the 300,000 peak in population in 2008 in net migration. Isn’t your policy announcement today just really undoing the damage you caused on population policy in Government? Well, far from it, Laura. What we did today was levelled with the Australian people. For most of the first week of the campaign, the Prime Minister has been talking about population. But you’re not fair dinkum talking about population if you are not prepared to discuss immigration. Now, we know that immigration is very important to any discussion of population because two-thirds of our population increase is driven by immigration. What we had was a big increase in immigration numbers under the current Government, from about 200,000, when the Howard Government left office, to 300,000 under the current Government. This is unsustainable, and what I did today was announce that over the first term of an incoming Coalition Government, we would bring immigration down to 170,000 a year. Now, we don't want in any way to hurt the economy, so what I said today was that we would keep numbers in the employer nominated visa categories, because obviously we want expanding business, and that means giving businesses the people and the skills they need. But let me conclude where I begin, Laura. We have nominated what we think is the right number for Australia going forward, and I challenge the Prime Minister to do likewise. Tony Abbott, just to pull you up on that, getting back to Laura’s question, wasn't it the Howard Government that set the laws in place that started to allow, particularly the foreign students that you seem to be concerned about, to come in. But it's the current Government which has presided over immigration numbers of 300,000 a year, and something needs to be done about an unsustainable rate of increase. Prime Minister, your response to that. Well, thank you and I'm glad Tony used the word fair dinkum, because let's be fair dinkum, let's look at immigration numbers, in 2008 - 300,000, that's true. And then we brought the immigration numbers down as the economy, obviously, was dealing with the impact of the global financial crisis. Down to 230,000. And then for the year we’re in now, they’re predicted to be 175,000, and then next year, predicted to be 145,000. That's net migration. So the trick here - and I think Tony should really reveal the trick - the trick here is Tony today has promised the Australian people, Tony today has promised the Australian people what I'm already delivering to the Australian people. It's pretty clever, but it's a trick. And of course, we cracked down on immigration rorts that we inherited from the Howard Government. Rort number one, that you could get on a skilled visa, a worker, you paid less than an Australian worker to do the same job. We cracked down on that. Rort number two, the shonky operators that we saw in the international education market, we have cracked down on that and we have broken the nexus between coming here to study, and getting to stay. These were rorts left over from the Howard Government, and if Tony wants to be fair dinkum, I think he needs to be fair dinkum about that too. But Julia, why didn't you tell us all this last week when you started a population debate and claimed that immigration and population had nothing to do with each other? I’m very happy to answer that question if I get an opportunity, David, if you want me too. I certainly have said we need a sustainable Australia, not a big Australia. I think people know that about me now. What I mean by a sustainable Australia is protecting our Australian way of life. That's having a job, being able to aspire to own your own home, getting decent service, health and education, having access to wide open spaces. All of these things come into our sustainable Australia policy, and that is what I want to see us develop, and for the future, just like now, we deal with immigration against our economic settings. I'd want us to deal with immigration against understanding what a sustainable Australia is. We never had a policy in this country for a sustainable population policy. I’m promising to deliver it with Tony Burke my Minister leading the effort. But why have the migration figures only emerged today? Well, those migration figures that I’ve just used are figures that are knowable and ought to have been known by Tony. In fact, I suspect they may have been, and, of course, I'm using for the projections, the BIS Shrapnel projections that we’re in the public debate during the course of today. Let’s get back to a question from one of our journalists. Malcolm Farr. Ms Gillard, you’ve started canvassing the region to find a host for a processing centre for asylum seekers, before they touch Australian territory. What is a reasonable time frame for having one of those centres operational? Would you guarantee you'll have a processing centre operational in your term of Government? Malcolm, I'm going to tell Australians the truth about this, and to tell Australians the truth, there's no quick fix. We’ve got to work through and we’ve started a dialogue with East Timor, and the President of East Timor, and the Prime Minister of East Timor have said that they are open to that dialogue. Now, what we are working towards here is something that would take out of the hands of people smugglers the very product they sell. Why would you get on a boat, pay your money, risk your life, if the outcome was you ended up back in the regional processing centre. It would be a lasting solution, it would stop the boats at the shores, not as they are travelling here to this country. So, that's what I'm aiming for. We started the dialogue with East Timor and are working through. Malcolm, as you would know, there's limits to what can be achieved during a caretaker period. But I think here, if we actually drill right down, and I understand that Tony will deny this, but I think it's increasingly true, if we drill right down, there's a fair bit of agreement here. We need a regional approach that involves our neighbours, we need a regional processing centre. That should be in a signatory to the Refugee Convention, a country that has taken on board the same obligations we’ve taken to ourselves, and I think we are agreed we should treat asylum seekers decently, men, women, children, should treat them with decency. If they are genuine refugees, then obviously, I think the Australian heart and compassion extends to genuine refugees. If they’re not, then they should be returned to their countries of origin. Just to be clear, no guarantee on when it would be delivered? here. We will take the time to get it done, but I'm determined to do it. Malcolm, look, let's be absolutely fair dinkum and upfront about this. There will never be a centre in East Timor. Never. Just never. The Indonesians don't like it and the East Timorese don't want it. And if the Prime Minister had spoken to the Head of Government of East Timor, rather than the Head of State before she first floated this idea, she would know that. There is never going to be a processing centre in East Timor. This is nothing but a pre-election fudge. If the Prime Minister is serious about offshore processing in a third country, she should pick up the phone to the President of Nauru. We have a centre in Nauru. It was built by Australian taxpayers. It can be made operational again in a just few short weeks. If that's what she wants, there's a clear action that she can take. Our next question comes from Chris Uhlmann. Tony Abbott, you talk about a pre-election fudge, do you think you should tell the Australian people that 90% of people that went to Nauru ended up in Australia anyway? Don’t you think you should be upfront with the Australian people and say this is just a way-station on the way to Australia? But the interesting thing, Chris, about the range of policies put in place by the previous Government, and they involved, importantly, temporary protection visas, which the Prime Minister won't support. They involved turning boats around, where it was safe to do so, which the Prime Minister doesn't support, as well as offshore processing in a country such as Nauru. The thing about all of those policies is that they did work to stop the boats. That’s the thing that distinguishes the Coalition from the ALP on this issue. We have the record of success. They have the record of failure. And what we propose to do is to go back to the policies that worked. And I say again, if the Prime Minister is fair dinkum about stopping the boats, if she’s fair dinkum about getting offshore third country processing, why not just pick up the phone to the President of Nauru, who is waiting for her call? Prime Minister, your response to that? Thank you and can I say sometimes, Tony, I think you are a little naive about these questions, it may be an endearing trait, but a bit naive. People smugglers are evil people and what happens is when our patrol boats approach people smuggling vessels, if they say that they are going to stop them and turn them around, then they sink the boat. And our patrol staff, being decent Australians, then dive in the water to rescue who’s there. So the risk ends up being borne by our defence personnel. And Tony, your very own former Minister for Immigration, Phillip Ruddock basically acknowledged this, that that is the problem, it's not safe to stop the boats, because the boats are destroyed before your very eyes. That's why we need a better solution about stopping boats before they even leave. And just on the question of being a little bit naive, Nauru, as we know, is in a caretaker Government with a deadlocked Parliament. It is not in a position to sign up to the Refugee Convention, it's not in a position to deal with these kind of questions. We are in a dialogue with East Timor. My determination is to continue that dialogue. Look, there's a factual error here, David. There is a factual error. Both sides of Nauru's politics support the reopening of the detention centre. There is nothing to stop it happening. Ok, we better get a quick response. Well, the Parliament of Nauru is deadlocked and, obviously, there isn't a functioning Government as we would understand that concept. We need to move on. Our next question comes from Laura Tingle. Ms Gillard, the economic statement released by the Treasurer notes that the world economic outlook remains very uncertain. Last week, seven European banks failed regulator stress tests and another seven US banks were taken over by regulators. The Government has committed to return the Budget to surplus in three years. Are you prepared to reassess your policy settings, stimulate the economy further to protect jobs, and delay the return to surplus if the developed economy is dragged down the global economy? I’m determined, Laura, to see the Budget return to surplus in 2013, as we’ve promised. And that would be three years earlier than originally predicted, and it would be in front of any other major advanced economy in the world. Now, I agree with you, as we look at the international outlook, we’ve got to be careful and there are fragilities and some troubling signs, and we’ve got to keep them under close watch. We, of course, do still have some have economic stimulus, though it is coming out of our economy, helping support jobs. I believe Laura, when we look at our future economy, including looking at international events, the truth is that when the global financial crisis hit, we, as a Government, did have the better economic plan. If we had done what Tony and others suggested, we would be in a deep recession, and literally hundreds of thousands of Australians would be out of work with all of the problems that come with it. Losing your home, the things we see happen on our TV screens overseas, people losing their houses, having their mortgages foreclosed. We avoided that. We’ve got people in work, and I believe for the future we’ve got the better economic plan. And I do note that Tony’s talked about the things he believes in. Well, what he hasn’t told you in that recitation, when it comes to the better economic plan, is he wants to put company tax up. Company tax, on businesses like Coles and Woolworths, which would feed through to the prices that people pay on everyday items. Bad for cost of living pressures, bad for jobs. But, Prime Minister, just quickly, the question is about a double-dip recession. If that happens, will you stimulate the economy again? So you’re not ruling it in or out. Well, I don’t think it is for me to rule in every economic circumstance around the global economy. But for us, I am very confident that we can deliver as we promised in the budget with the surplus in 2013. Look, the Government likes to claim credit for avoiding the global financial crisis. But all serious observers would say that Australia’s relative economic success owes far more to the reforms of previous governments, than it does to the spending spree of the current Government. Now, obviously, when the global financial crisis was at its worst in late 2008, some stimulus was necessary. But with this Government it was too much, too soon. Yes, it’s important to act to save jobs. But that never justifies waste, and what we have seen from this Government is almost obscene waste, in programmes like the pink batts programme, and in programmes like the school halls programme, which the Prime Minister was herself responsible for as Deputy Prime Minister and Minister for Education. Now, we all know that there’s been rip-off after rip-off in the school hall programme, and I suggest that it’s very difficult to trust the Prime Minister with $350 billion of government spending, when we couldn’t trust her to deliver $16 billion of government spending without enormous waste. Now, as for the possibilities that might arise in the future, unfortunately because of its extravagance, this Government has put Australia in a somewhat weaker position to respond to any subsequent economic problems. Next question is from Malcolm Farr. Mr Abbott, I think it was last Sunday you were in western Sydney, and you were listing the increases in the cost of living hitting families, I think at one stage you mentioned bread prices had gone up 11 per cent. 12 per cent, I think. I’m glad you remembered that, I had forgotten that. Now, can you remember what policies you would implement in government, specifically referring to groceries, that would keep prices down? What we wouldn’t do is promise something called GroceryWatch, and then not deliver, which of course is what the current Government did. Look, the best thing we can do is get government spending under control. Get debt and deficit under control. Because if we get debt and deficit under control, there’s less pressure for higher taxes, and if we aren’t out there borrowing $100 million a day every single day as a government, there’s more money available to be borrowed by others, by small business. So that essentially is the best thing we can do right now, to help all the people who are suffering in the hard scrabble marketplace. It’s to try to get debt and deficit under control. Families have to live within their means, and governments should live within its means too. But, just to be specific on Malcolm’s question, what would you do to reduce grocery prices or keep them down? Look, I will not make the mistake that the former Opposition now the Government did, and promise to do something which is pretty much impossible to dictate from government. Sure, you can try to ensure that there’s competition in the markets, and we’d try to do that. Sure, you can try to ensure that we’ve got the best possible settings by government. But government can’t, with a stroke of a pen, reduce grocery prices. And it was very foolish, verging on the fraudulent, for the Labor Party to make that promise before the last election. Prime Minister, you’re response on this cost of living question? Well, very, very, quickly, if you put an extra tax on big companies like Coles and Woolworths as Tony is proposing to do, guess what? Prices go up. Because they’ll be looking to recoup that tax from consumers. Now, that’s Tony’s policy setting. That’s the reality of what he would do if he was Prime Minister. For families, I believe in taking a bit of pressure off. We’ve delivered tax cuts three years in a row. We created the Education Tax Rebate, and I’ve recently said we’d extend it to school uniforms, help with those costs of getting kids to school. We increased the Child Care Tax Rebate to 50 per cent of out of pocket cost. Give that extra helping hand with the cost of child care. We did a major increase in the pension to help older Australians particularly with the pressures that are on them. These are measures to help with cost of living. And then there’s the other side of the equation, what’s in your pay packet, which clearly is about your security at work. We ended WorkChoices, delivered the Fair Work laws, I was very proud to do that as the relevant Minister and get it through Parliament. And of course we’ve spent much of this first week of the campaign canvassing Tony’s camouflage around the plan to bring back the worst aspects of WorkChoices. Alright, our next question comes from Chris Uhlmann. Ms Gillard, Australia is committed to a target of 5 per cent reduction in carbon emissions by 2020, and you’re committed to putting on a carbon price. How long can we go before we reach the point of no return? At what year will we get to where Australia can’t meet that cut, because you’ve delayed too long? And you yourself said, last year, to delay is to deny. Chris, I’m an optimist. 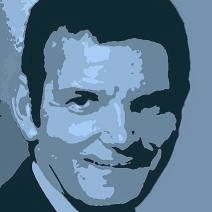 I’m an optimist, and I believe we can work our way to a community consensus about putting a cap on carbon pollution, and designing the market based mechanism that will support that. Now, we had a consensus in Parliament House, and obviously Tony became Opposition Leader and ended that consensus, and the rest, as we all know, is history. Now I believe we’ve got to take the community with us, to get a deep and lasting consensus, and if elected Prime Minister then I will lead that debate, to take the community with us. I’ll work with some honest, decent Australians in our citizens assembly to get the job done. And, at the same time, we will be implementing measures that make a difference for carbon emissions. But I’m not going to kid people, we’re not going to get to those targets unless we put a cap on carbon pollution and have a market based mechanism. And Tony, I think now, rules that out entirely. And what that means is under his plan we would see him pay polluters, and carbon pollution go up by 13 per cent by 2020. That’s not the way forward. I’m going to lead, lead to get a community consensus to find that ultimate way forward, and in the meantime we’ll be acting. Record investments in solar and renewables. The transmission lines to bring that power to your home through the national electricity grid. Changing the cars we drive. Making differences to where we work, with greener buildings, no more dirty power stations, as well as rewarding those companies that do the right thing early. But Prime Minister, the question is have you been advised there’s a point at which, a date at which, it’s too late and we fail to meet the target we’ve committed to? I think we can do what we have committed to do. I believe we can get there. We’ll get there with the cap on carbon pollution. When does that have to happen? Well, we need to work through, I’ve said as Prime Minister I would assess this in 2012. But what I’m not going to do, David, what I’m definitely not going to do is try and get legislation through the Parliament, maybe even get it through, and have all of the things change in our economy that would then change, only to find at the next election, maybe with a swing in the political cycle, that that is all taken away. That would be dreadful for our economy, and that’s why we need this lasting consensus. Look, I regret to say that there has been a complete failure of leadership from this Government and from this Prime Minister. As you said, Chris, she said in November that ‘delay is denial.’ She said last November ‘that if you can’t manage climate, you can’t manage the future.’ Now the Prime Minister says that this is all too hard for our Parliament, it’s got to be sent off to a glorified focus group. Well, we have a citizen assembly. It’s called the Parliament of Australia. If the Parliament of Australia can’t make these decisions, what is democracy for? So, look, I think that the Prime Minister should be very clear about where she stands and how she’s going to get us there, and I think that the Prime Minister believes in a carbon price, Senator Brown wants a carbon tax. Thanks to the Green preference deal there will certainly be a Green balance of power in the Senate. We will get a carbon tax if this Government is re-elected, as sure as night follows day. Mr Abbott, you’ve declared industrial relations reform essentially off limits for the next term of Parliament in the last week. How does this fit with the productivity agenda, particularly when you're proposing taxes to go up on companies by three percentage points? Laura, I want to make two points. The first is that the ultimate conviction of every democratic politician has got to be to respect got to be to respect the electorate. I respect the electorate. I also respect the people out there trying to run businesses. Now I've spent a lot of time, particularly over the last couple of months, travelling the country, listening to people in business, and what they are telling me is that there has been a lot of change, too much change, they say, over the last few years and what they want is a period of stability. They say they can live with imperfect laws. What they can't live with is constant change and so I am going to give them a period of stability. But Tony Abbott, if you believe that reform is in the interests of boosting productivity why don't you lead on this, why don't you convince Australians that this is the way to go? Well, because as I said, I respect the verdict of the public, the verdict of the people, at the 2007 Election, and the Prime Minister will say, she has said repeatedly, that the Government's existing laws provide scope for improvements to productivity, let's give those laws a chance. Well, I think we’ve seen this week, as we went through the farce of Tony signing pieces of paper in a radio studio, only 24 hours later for his spokespeople in his party to come out with a plan which would require changing the Fair Work Act, that all of this is camouflage and it didn't last 24 hours. Tony believes in WorkChoices. Now, I don't agree with him about that, but he does believe in it. He believed in it when he was a senior Minister in the Howard Government and they delivered WorkChoices. He believed in it when he authored his book 'Battlelines'. He believed in it in a large number of public statements since, and the single most important speech you can give as Opposition Leader, the Budget Reply speech this year, there was Tony saying aspects of WorkChoices will be back. Well, I believe respect for the Australian electorate requires Tony to come clean on his real plans. He's always believed in WorkChoices, that's the conviction. He always will, and so people should expect, if he is Prime Minister, then the worst aspects of WorkChoices will be back. Obviously, in the Labor Party, in me, it's in our DNA to believe in fair workplace relations, that's why we got rid of WorkChoices and introduced the Fair Work system. Ms Gillard, your award modernisation process, you said that no employees or employers would be worse off. There have been some workers who've had to apply for some sort of relief because of changes in awards. There's no such facility for employers. Many of them, who are small businesses, they are paying more. Will you change the structure of the revamped awards so that these employers, again as I say, many of them small businesses, can get some relief, as well? No Malcolm, I won't be doing that. The Fair Work system that we've introduced, I believe, gets the balance right. And we asked Fair Work Australia, the independent industrial umpire, to do the thing that had been neglected for years and years and that was to take more than 4,000 old big awards and modernise them and we've done that to around 120 simple modern awards. Better for employers because they can find the award that applies to them, better for employees, because they can find how they should be paid, and that simplification is literally worth billions of dollars of benefit to the economy with the benefits of well, of creating a uniform system of workplace relations for the private sector, so you don't have to worry anymore if you're in a State system or in a Federal system. Now in the transition, employees got the benefit of take-home pay orders to make sure that they couldn't lose take-home pay and employers got the benefit of a five year transitional period. I believe that's the appropriate balance. I'm committed to keeping the Fair Work system. I'm the architect of the legislation that went through the Parliament. I believe in it. My Government believes in it. The Labor Party believes in it, and the contrast here is between that and Tony's passionate and long-standing belief in WorkChoices. Look, I don't say that the system is perfect, but I think that it's the best that we are likely to get at this time and for the foreseeable future. As I said, I respect the verdict of the people at the 2007 election and I respect what I've been told by businesses around the country. We have to work within the existing legislation to address the sorts of issues which you've spoken about. The next question is from Chris Uhlmann. Julia Gillard, you’ve said that you won't speak about the conversation that you had with Kevin Rudd. Fair enough. You've said you won't speak about what happens in Cabinet. Again, fair enough. Can you give us a simple number? How many times did you warn Kevin Rudd that his government, your government was on the wrong track before you took his job? Was it once, was it twice, was it three strikes and you're out? How many times did you tell him, did you warn him, before you took his job? Well, Chris, I’m not going to canvass conversations I had with Kevin Rudd, but I am very happy to say this. I understand that when I became Prime Minister on the 24th of June, that there were a lot of Australians who were pretty surprised, pretty taken aback, that they actually were asking themselves the question, you know, "What's happened, what's gone on here, why has it happened?" And I want to answer for Australians the why it's happened. And the truth is, obviously, I worked alongside Kevin Rudd and wanted to deliver good government to this country. Increasingly, I became concerned that the Government had become stuck and bogged down in a series of issues. The acrimonious debate about the mining tax which, I thought, was putting pressure on mining communities, which wasn't good for our economy. I was also concerned about things like being a sustainable Australia, and from the position of Deputy Prime Minister, I did everything I could and I worked as hard as I could to try and correct some of the problems that I could see. But it came down to a really difficult choice, and it didn't sit easily with me. It was a hard decision, a really hard decision, but it came down to a choice as to whether I should continue to be of service to Kevin Rudd, or whether I needed to look to my service to the Australian people. It's a hard choice. The choice I made was to be of service to the Australian people. Now overwhelmingly, my Labor colleagues came to the same decision and I understand that Australians are still thinking this through and I understand Tony will make some political points about it, but Tony knows what it's like to think that your political party needs new leadership. That's why he's standing here instead of Malcolm Turnbull. Now appropriately, the next decision is for the Australian people. When I became Prime Minister, I said I would quickly move to an election to give Australians the choice and that's what the election on 21st of August is all about. But just quickly, Prime Minister, Chris's question is not about what was said in confidentiality, but just how many warnings were there - were there three, were there none? Well, I am not going to canvass conversations that I had when Kevin Rudd was Prime Minister and I was Deputy Prime Minister. I’m simply not going to do that. Sure. Look, this has been a bad Government and the problem has been the Government, not the Prime Minister. The problem has been the policies, not the face at the top. Now, unfortunately, they've changed the face at the top, but nothing has really improved. In fact, the shambles has just got worse over the last month or so. The Prime Minister, the new Prime Minister set herself three tasks, three messes created by the Government, that she was going to fix - the mining tax fix. Well, that hasn't really worked. The boat people fix, well that obviously hasn’t worked and the climate fix, we all know what that is, another fudge. Now, this is the problem. It's been a very bad Government that is trying as it were, to trick the public that it's somehow different because it's changed the person at the top. But we've seen this at the State level and I think people are very disappointed with governments and political parties which, in the end, play these sorts of factional games, these sorts of games over the leadership. Alright, our next question is from Laura. I have a question for both of you, well questions for both of you, on Afghanistan. A conference of a lot of Australia's allies in Kabul last week was talking about a 2014 exit strategy. Ms Gillard, do you intend sticking with the former Prime Minister's stated ambition to withdraw troops in two to four years’ time? And Mr Abbott, in light of the Kabul conference, is sending more troops still an appropriate strategy to pursue if you're in government? I might just say, we're nearly out of time for the question and answer session, so if we can keep these tight. Tony Abbott. Yeah, well Laura look, I think our troops in Afghanistan are doing a very difficult job magnificently, and I think it's important that they stay there until that job is done, and the job is to ensure that Afghanistan never again becomes a safe haven for terrorists. Now as for what might happen in the future, let's see how things develop, and I would respond as Prime Minister, appropriately I hope, to any development, but I'd always do it with the advice of the military chiefs. My position is the same as Kevin Rudd's, and the position is we've got a mission. The mission there is to train the Afghan National Army, so that they are in a position to guarantee stability and security in the nation. Our best estimates now on advice are that will take between two and four years, but Laura, the thing that defines how long we're going to be there is getting the job done, not a deadline in time, though our advice currently is the mission will take two to four years more. Alright, look, there are many issues that we could still cover tonight, but unfortunately we have run out of time. It is time for closing statements and Prime Minister, once again you're leading off. Thank you very much, David and thank you, Tony, and I think that that's been a good discussion and Tony and I have had the opportunity of having a lot of debates and discussions over our years in politics. I think this has been a good one. But there are real differences between us and as we move to the 21st of August, Australians will be assessing those differences. As Prime Minister, I would never, I would never, cut back the investments in our schools that are enabling us to have better-quality teaching. I would never cut back the investments that are giving computers to kids. I would never cut back our trades training centres, because they're so important to giving kids skills for real work, the real world, and I would never cut back the investments we're making in GP Super Clinics, in after hours hotline to help you find a doctor. I wouldn't cut back our investments in e-Health records, the shape of the future, and I wouldn't stop building the National Broadband Network, so important to the jobs of the future. These are real differences. I would go forward investing in the services that Australian families need. Great schools, health care, and the shape of the future, the National Broadband Network. And as Prime Minister, I simply can't imagine putting up the company tax rate and having that flow through to prices that families pay. I'm going to decrease, I'm going to cut the company tax rate. And I wouldn't ever, I would never go back to WorkChoices. It would be wrong to do so. I'd go forward with our Fair Work system. Now the election on the 21st of August will be about the future of this country and I believe we are a confident, optimistic people and there's no challenge in our future, no challenge that's too hard, that we won't master it if we do it together. And I am an optimistic person. I am a believer that a glass is half full, and I will bring that optimism to think my way through the new solutions, to learn the lessons, to deliver the policies that Australia needs, policies to make sure we've got a strong economy and prosperity, including getting the Budget back to surplus in 2013. Policies to make sure we've got a sustainable Australia, that we're taking with us into the future a very special, very precious Australian way of life, and policies to make sure that families have the services they need. That's what I'm standing for. I'm going to be submitting myself to the judgment of the Australian people on the 21st of August and I believe in their decency, the decision is for the Australian people. Thanks, David. Thank you, Prime Minister. Mr Abbott your closing statement. Well thanks, David. My pledge to the Australian people is to end the waste, to pay back the debt, to stop the new taxes, and to stop the boats. That's my action contract with the Australian people. Under the Coalition, there'll be no big new taxes, decisions will be made by Cabinet, not powerbrokers, and government will live within its means, like you do, like businesses do. Now tonight was the Prime Minister's chance to tell us why the Government deserves to be re-elected, but she couldn't. The big risk in this election is that a really bad government might get the second chance that it doesn't deserve and that Australia can't afford. This is the first government in living memory which is not running on its record. It can't run on its record because that's record spending, record deficits, record boats and getting rid of an elected Prime Minister in record time. Re-elect this Government and there'll be six years of pink batt disasters and school hall rip-offs. There'll be more spending, more backflips, more debt, more taxes. It will just get worse. There’ll be more hits on your standard of living. We’ll get a mining tax if Labor is elected. We’ll get a carbon tax if Labor is elected, thanks to the preference deal with the Greens that not even Bob Brown likes. So this election will determine whether the Prime Minister is to be elected by the people or by the powerbrokers. Whether Prime Ministers are to be chosen on the basis of the job they’ve done, or gender. And whether the national government should be run as a mates machine like the Labor Governments in New South Wales and Queensland. It’s about whether the public can trust the Labor Party when not even Kevin Rudd could. So there is a better way. A fair dinkum paid parental leave scheme. That standing Green Army, 15,000 strong. Community-run schools and hospitals with more beds and above all else, a better economy with no reckless spending and less debt. So, when you come to vote, I hope that you will look at the record, not the slogans. Look at the incompetence, not the promises, and look at the broken Government, not the new face at the top. I ask for your support to end the waste, repay the debt, stop the new taxes and stop the boats. This Coalition is all that stands between the Australian people and three years of more incompetence and more taxes, so let’s have a change of government before any more damage can be done. Finally, let me say that this has been a good debate and I say to the Prime Minister, let’s have two more of them! On that note, I would like to thank you both for taking part in tonight’s debate and wish you well for the remainder of this campaign. Can I also thank our panel of journalists: Chris Uhlmann, Laura Tingle and Malcolm Farr. And thank you for joining us. I hope this has helped you with your decision on who to vote for come August 21. I’ll now invite the two leaders to shake hands and wish you all a good night.
. Wednesday Column: Debt free. Got any other ideas to stifle growth? And they do like each other. Here's Chris Uhlmann.
. Okay, so who writes the best letter? If arguably meaningless. Net migration is sliding by the quarter. Australia needs a population that our services can satisfy, our infrastructure can support, our environment can sustain, our society can embrace, and our economy can employ. 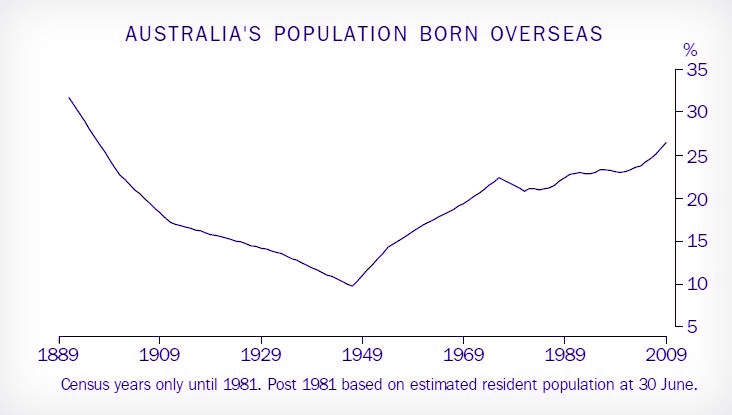 Australia's population growth since World War II has helped create the prosperity we now enjoy. Successive waves of post-war migration have expanded our capacity as a nation. Under the Howard Government, our immigration programme enjoyed support from a majority of Australians who were confident that the programme was fair, competently administered, and delivering benefits to the entire community. Under Labor, migration-fuelled population growth has caused Australians to become increasingly concerned, and to lose confidence in our broader immigration programme. The hopeless failure of Labor’s border protection regime has further eroded community trust. Under Labor, net overseas migration has risen to 300,000 people per year, against a long run average of around 140,000 per year. At this rate Australia’s population would reach 42.3 million people by 2050, significantly above the earlier Intergenerational Report II (IGR) forecast of 36 million. As a result, the quality of life for Australians living in our major urban areas today is under great pressure. Fuelling population growth today must not rob future generations of the quality of life and opportunities we currently enjoy. That is what sustainability is all about. On the eve of an election, Labor politicians have suddenly started to say they no longer believe in a “big Australia” – while cynically trying to put off any decisions on these issues until after the election. While Labor may have changed its rhetoric under its new leader, Labor’s policies on immigration or population have not changed. The Coalition believes it is necessary to ease population growth to deliver more sustainable population levels, based on our present and future capacity, so that our infrastructure, services and environment can catch up. Unlike Labor, the Coalition’s population and immigration policy is clear. The Coalition will set clear parameters for population growth by tasking a renamed Productivity and Sustainability Commission to advise on population growth bands that it considers are sustainable. This recommendation will provide a Coalition Government with the expert advice necessary to establish the framework for setting migration programmes. The Coalition will reduce Australia’s annual rate of population growth from more than 2 per cent under Labor, to our historical long-run average of 1.4 per cent within our first term. This will require reducing our annual rate of net overseas migration from 298,924 in 2008/09 to no more than 170,000 per year by the end of our first term. 3. Make a Clear Commitment to Skills Migration and Regional Australia. The Coalition will ensure that two-thirds of our permanent migration programme will be for the purposes of skilled migration. A Coalition Government will also quarantine the level of employer nominated skills migration and 457 temporary business visas to at least the levels it inherits. In addition, the Coalition will liberalise arrangements for temporary business visas (457s) subject to clear standards, to make them more accessible to business, especially small businesses, and business in regional areas, with proven skills shortage needs. To address the skills needs of regional areas and small business, the Coalition will encourage the settlement on either a temporary or permanent basis of new arrivals in regional and rural areas. States such as Queensland and Western Australia will be afforded a high priority for permanent and temporary skilled visa applications. A Coalition Government would also seek to resettle more entrants from our refugee and humanitarian programme in regional areas, where these resettlement programmes have proved to be highly successful. The Coalition will produce a White Paper on immigration that will reframe the structure and composition of Australia’s immigration programme to address the policy challenges of sustainable population growth. A Discussion Paper will be released by the end of 2010, with a final paper to be completed by the Coalition’s first Budget in May 2011. This will help inform the composition of the 2011-12 migration programme. Australians want their government to take control of population and immigration policies to restore confidence and ensure our immigration and population levels are sustainable and in the national interest. The Coalition’s plan for Real Action on Sustainable Population Growth will restore confidence and re-establish consensus on the benefits of our immigration programme. Subjects: The Coalition’s real action on sustainable population growth; Leader’s Debate preparation; Penny Wong’s comments on carbon tax. Look, it’s good of you guys to interrupt your debate preparation to come along this morning. Look, last week, for most of the week, the Prime Minister was engaging in a debate about population. It’s impossible to discuss population without also discussing immigration because immigration accounts for about two thirds of our population increase. In fact, it’s fundamentally dishonest of the Prime Minister to pretend that population has nothing to do with immigration. So, today I’m here to launch the Coalition’s 2010 Immigration Policy. I’m pleased to be joined by my friend and Shadow Minister for Immigration Scott Morrison and also by my friend and Shadow Parliamentary Secretary for Population, Cory Bernardi. Immigration was running at about 200,000 a year in the last term of the Howard Government. Under the Rudd/Gillard Government, immigration has gone up to 300,000. We had 200,000, more or less, under the Howard Government at the time of an unprecedented economic boom, under the Rudd/Gillard Government, we’ve had 300,000, not withstanding the global financial crisis and the associated economic slowdown. 300,000 is just not sustainable. Immigration at this rate is just not sustainable. So the Coalition will reduce net overseas migration to 170,000 a year within our first term. We will maintain though, the various employer nominated categories, because it’s important that business has the skills and the people that it needs. Most of you may not be aware, but I am a migrant myself. Australia is an immigrant society, proudly so. The Coalition parties are pro-immigrant, but it’s very important that our immigration program have the support of our people and that is what this policy is designed to ensure. So I’ll now ask Scott to say a few words and then we’ll hear a little from Cory. Thank you, Tony. The policy we’ve released today is all about one thing and that is about a sustainable rate of population growth and how to achieve it and what can be done immediately to move towards that goal. Sustainability is all about ensuring you don’t deny the opportunities and quality of life that we enjoy today to those generations that follow. That’s what sustainability means and it’s important that we don’t run at levels of population growth, which at over two per cent per year at the moment, are historically high and in recent times, but also historically very high in terms of global population growth, global population growth today is around 1.2 per cent. In the OECD countries, it’s less than one per cent. What we are proposing in this policy is to restore within a first term the population growth rate to 1.4 per cent, which is Australia’s long run average. At that long run average, Australia’s been able to enjoy considerable and great economic success, particularly throughout the 11 and a half years of the Howard-Costello Government, the Coalition Government. So returning those growth levels to that level, within the first term of a Coalition Government would ensure we are meeting the needs of our economy, that most importantly we are meeting the needs of preserving the quality of life, both for current generations and future generations. To just run you through some of the key elements of the programme, in particular where we restate today our commitment made back in April of this year, to establish a Productivity and Sustainability Commission from the current Productivity Commission, whose job would be to set growth bands to advise the Government on what rate of growth we would need to be at in the future from year to year to ensure that we’re growing at a sustainable level. The Productivity and Sustainability Commission would be basically keeping score on the performance and delivering for infrastructure, services, environmental management, all of these things, to give us the confidence, and most importantly to give Australians the confidence that the rate of growth at which we are setting our migration program and our overall rate of population growth is sustainable. Tony has outlined the position on where we need to get to on net overseas migration and a rate of growth within our term and that’s taking real action on immigration. The Prime Minister cannot have it both ways. She cannot say that she doesn’t believe in a big Australia, and then go onto say that she’s not going to talk about immigration. The only thing that can be done practically, in a most significant way, in the next three years is to remove the population pressure that is forcing the decline in qualities of life of services and infrastructure and the things people are experiencing at the moment. Tony has outlined also that we will be making clear commitments to the areas of the employer nominated program for skilled migration and in the document you’ll also see that we’ve made commitments to give priority to particularly high growth states like Western Australia and Queensland and ensuring that our employer nominated programs and skilled programs, we’re addressing the needs of small businesses and particularly businesses in regional areas. We will establish on coming to Government a process, a white paper process, which will be tasked to identify the rorts, the abuses, the tightening of the program that can be achieved and will be achieved for the Coalition to meet this target. There will be a discussion paper by the end of the year and the white paper process would be completed in time to set the annual migration program in our first Budget. They’re the commitments that are outlined, it’s a clear policy, it’s not one line in a speech, which we always see from the Prime Minister, it’s a considered policy, it’s a responsible policy that address the population pressures that are being faced mainly by people in our cities around the country. Population Policy, I’ve consulted widely with Australians in every state and territory and let me just say their concerns are not about, directly about, immigration, they are a very welcoming nation and the people of Australia understand that immigration has played a key role in our foundation and development of our country. But they are concerned about the productivity of our nation, the liveability and the sustainability of our migration program. The Coalition’s come up with a policy that will reflect the concerns, the very real concerns of the men and women of Australia and will ensure that our nation will continue to grow and get stronger in the years ahead. Mr Abbott, can I ask you [inaudible], the policy you announced in April, you said that you would delegate the to the Productivity Commission, to set benchmarks, to set targets and Mr Morrison said during the week that you would be confined by what they recommend. Haven’t you just confined them to a target? The Productivity and Sustainability Commission will give us advice about future population levels, which are compatible with economic and environmental sustainability, but it will always be the Government’s responsibility to set the number. Mr Abbott, the BIR Shrapnel has already predicted a slowdown in net overseas migration to 145,000 persons by 2011/2012. So are you saying that an Abbott Government, in your first term, would actually have a larger net overseas migration than a Gillard Government? No, I’m saying absolutely not. The interesting thing about the Prime Minister last week was that she was very, very keen to talk about population, but not honest about the role of immigration in population. Now, you cannot have a population discussion without also having an immigration discussion. And you can’t say you are against a big Australia without also discussing the immigration rates. So, what we’re announcing today is a demonstration that we are fair dinkum, that we will back up our talk with appropriate policy. That’s what we’re doing. What’s the difference between your policy and Labor’s policy? I mean, BIS Shrapnel is forecasting 145,000 by 2011/2012. So are you for higher immigration? Is this [inaudible]? Look, if Labor wants lower immigration, let it specify a number. They can’t say they’re in favour of lower immigration without specifying a number, and that was the fundamental dishonesty of the Prime Minister last week. She said she wanted to dramatically reduce population growth, without having the guts to talk about immigration numbers. Now, if she doesn’t like our number, she should say so. If she thinks our number is too low or too high she should say what her number is. What would the population be, Mr Abbott, under your policy by 2050? What population do you want to see by 2050? Alex, it would be a lot lower than the 36 million nominated by Kevin Rudd as his ‘big Australia,’ and supported at the time by Julia Gillard as Deputy Prime Minister. Well, as Scott said, we would be guided, not ruled, but guided by a White Paper which we would commission shortly after coming to government, and which would inform decisions that would be announced at budget time next year. What we won’t cut, though, are the various employer nominated categories, because we do need skills, business does need to continue to grow, and it’s very important that we don’t put any obstacles in the way of growing business. [Inaudible] the Family Reunion Programme, and if so, why shouldn’t Australians be allowed to bring relatives to Australia? Well, again, those sorts of specific details can only be decided in government, and they would be informed by a White Paper process. What we would do is manage the programme to bring it down to what we think are sustainable long-term numbers. But what we won’t do is get in the way of legitimate Australian business that is seeking appropriately to expand. How do you know you can hit your target if you can’t say which parts of the programme you’ll cut from? Well, because there are all sorts of different components, and there are some very large components of the immigration programme that if reduced would certainly bring us very swiftly to the 170,000 maximum that we’re nominating. So it’s just a question, it’s just a question of intelligently managing the programme, making sure that all of the entrants in these various categories are fair dinkum. That’s what we did before, particularly under Phillip Ruddock, that’s what we will do again. No, it’s not. No it’s not. Sorry Tim, it’s not. [Inaudible] migration programme, it’s the bit that is under the control of government of skilled migration is almost two-thirds, and the rest is family reunion and refugees. So you’re planning to cut students? You’re planning to cut students, foreign students? That’s the biggest target, right? That’s where you’ll get your bang for the buck, cutting foreign students coming into Australia? What we are planning to do is to get our immigration levels to those which we believe are economically, environmentally, and politically, if you like, sustainable. We need an immigration programme which can be supported for the long term by the Australian people. If we want to be a cohesive, prosperous society we need strong, popular support for the immigration programme, and that’s what this policy is designed to achieve. Are you targeting foreign students, and if you are, why would you do that when it is a billion dollar industry for Australia, one of our biggest industries? Look, I am all in favour of Australia selling education, but what I don’t want us to be doing is selling immigration outcomes in the guise of selling education. Mr Abbott, the student numbers have been coming down, and the requirements have been tightening. 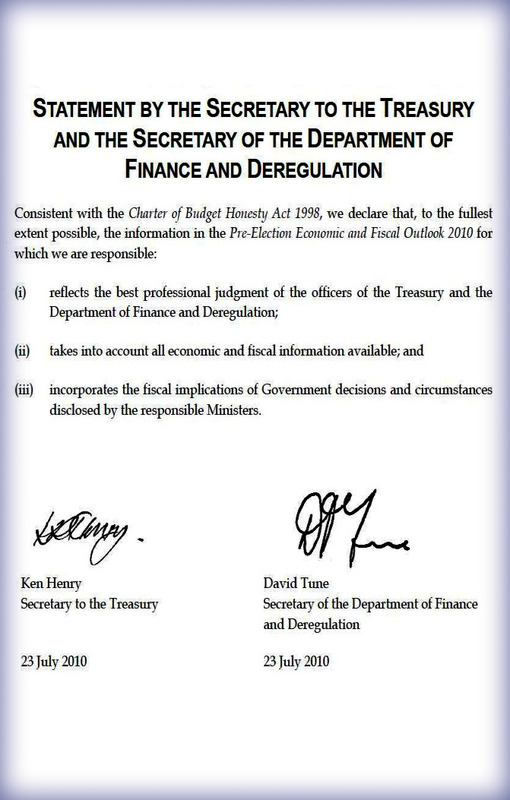 So wouldn’t it be more relevant to take the last financial year rather than 2008-09, and what do you understand the final figure, well, the figures, the projected figures for the last financial year will be? Well, look, Michelle, I don’t have access to official advice. All I can go on is the published figures, and the published figures show that calendar ‘09 it was something like 277,000. So what we are proposing is a reduction of 100,000 on ’09. That’s what we’re proposing. Now, as I said, we’re going to get there sensibly, carefully, with good advice. All we are saying today is that what we’re not going to do is to restrict the various employer nominated categories, because we think that they are important for Australia’s continued economic health. But look, I might ask Scott to say a few words, because he’s more familiar with all of these tables than I am. Well, the figure that Tony referred to of 277.7 is the calendar 2009. There have been no figures released by the ABS for 2009-10. We don’t have access to that information. No, there’s no estimate, there’s no figures that we’re aware of, that’s been brought to our attention. And the migration program is set on a financial year basis. And the most recent financial year figures that we have available to us is the 2008-09 figures and if you go to the Department of Immigration’s Population Flows document, you’ll find a fairly extensive outline of the program, but ultimately we would have to deal with the 09-10 figures when they’re available and they’re not available today. [inaudible] 170,000. What’s the thinking behind 170,000? What’s that based on? It’s based…well, as I said in the opening remarks, our target here is to get the population growth rate to 1.4 per cent. And our estimate is that that requires getting net overseas migration to at least 170,000 by the end of the term. What we’re trying to do here is control and get back to a sustainable level the population growth rate. The population growth rate is what puts pressure on our cities around the country. Remember, more that nine out of 10 people who come into Australia end up in the cities. The Government can talk til the cows come home about getting people out into the regions and we would pursue policies similar to that but we cannot be unrealistic and disingenuous with the Australian people by suggesting that is a substitute for easing the population pressures on those in western Sydney and other parts of the country. It is just simply not telling the truth. …1.4 per cent is your growth target for the next term. And would adjust pop…is the 1.4 going to be the upper limit that’s going to have to [inaudible] or the lower limit or the medium limit? Well, the Productivity Commission, I’m sure, will advise us in due course, Phil. 1.4 per cent, I think, is a very reasonable estimate of what could…well it could be right smack back in the middle of it, or it could even be at the upper end of it, Phil. But we’ll have to wait and see what they say but, what I think the Australian people want…no, let me finish, what the Australian people want to know for us going into this election is where we would take population growth. And we will take that growth level to 1.4 per cent. But we’ll also be getting the Productivity Commission…1.4 is what we’ve given a commitment that it’ll be no greater than, under a Coalition government by the end of our first term. Now, the Productivity and Sustainability Commission will give us advice and they will give us a band, as you know, not a single figure, a band. Mr Abbott, why did the Liberal Party endorse David Barker as its candidate? Well, he’s unendorsed. He’s disendorsed. He’s gone, he’s finished. And we now have a new candidate, our new candidate in the seat of Chifley is Venus Priest. She’s a 41-year-old small business person who lives in the area. Look, the point is, the point is that attacks on people based on their religion should have no place whatsoever in this election campaign. Well, I just, I’m not aware of Don’s particular comments, but I just want to make it very clear that attacks on people based on their religion have no place in this election campaign and will not be made by me. How’s your debate prep going? Debate prep? Look, of course. Who wouldn’t be? Who wouldn’t be? I mean, this is obviously a pretty big day in the campaign. It’s obviously an opportunity for me to put the Prime Minister on the spot for the essential fraudulence of Labor’s campaign so far. The fact that there’s a fundamental dishonesty about all of the things that she’s claimed to fix. The fact that she hasn’t fixed the mining tax, she hasn’t fixed boat people, she hasn’t fixed population, she hasn’t fixed climate change. I mean, all of the announcements that she made in the run-up to the election campaign, and since the election campaign started, are essentially fraudulent. And while I’m on that subject, and thanks for the opportunity Alex, look, let’s be very clear about this. The Prime Minister’s sub-contracting out of climate change policy to a glorified focus group is a fundamental abdication of leadership, or it is camouflage for the coming carbon tax. And I notice that Senator Wong today said that the Government will not give up on a carbon price, regardless of what this focus group says. In fact, it’s pretty clear from what Senator Wong has said today that basically they’ll keep going back to the focus group until the focus group gives them the answer that they want. And the answer that they want is, there must be a carbon price. In other words, there must be a carbon tax and so I just say again, as I will say every day between now and polling day, if you don’t want a carbon tax, you’ve got the change the government, because as sure as night follows day, if this Government is re-elected, there will be a carbon tax. And what that will mean is fewer jobs, higher prices, pressure on families’ standard of living. Mr Abbott, if population is such a concern, and population growth, why was your government telling us, and giving us Baby Bonuses, telling us growth was good for the country, have one for mum, dad and the country? Isn’t this more about people [inaudible]? No, look. It’s…there are obviously a whole range of factors that play into population. Natural increase is significant. And I would like to see our birth rate improve because even now, despite the uptick in the birth rate over the last few years, it’s still significantly below replacement level. But two thirds of the population increase is coming from immigration and it’s got to be sustainable. It’s got to be something the Australian public can support. I want to see a sustainable, supportable immigration program, going into the future because, as I said, I am an immigrant myself. We are an immigrant society. We always will be. That’s a good thing. But let’s have an immigration program that people can support, that they don’t think is out of control. That they don’t think has been sub-contracted to people smugglers. That’s what we want to do, to give the Australian public an immigration program that they know is under our control and is firmly in Australia’s national interests. Thank you very much, thank you.
. Sooner babies means more babies. It's a boom.